During 2018, the Company obtained 245 new product registrations, including 27 new product launches worldwide. Highlights include CRONNOS TOV®, a novel solution for soybean rust in Brazil and POSTSCRIPT™, a herbicide for control of rice weeds and grasses in FULLPAGE™ Rice varieties in the US. The Company registered its proprietary nematicide NIMITZ® in India, China and South Africa, as well as in Brazil and a number of additional countries in Latin America, and on a range of new crops in the US and Asia Pacific. Other notable product registrations included AGIL®, a systemic herbicide for selective weed control of a wide range of grasses in many broadleaf crops in China and in several European markets, and BREVIS® a differentiated post-bloom fruit thinner in apples to optimize fruit load and size in Australia. In December 2018, the name of the Company was changed to ADAMA Ltd., achieving the final milestone in the combination between Adama Agricultural Solutions Ltd. and Hubei Sanonda Ltd. 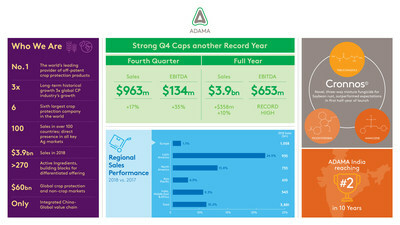 While the stock abbreviations of the Company's A-shares and B-shares have changed to ADAMA (A) and ADAMA (B), the stock codes (tickers) remain the same – 000553 and 200553, respectively. Europe: Closed 2018 in line with 2017, a significant achievement in the face of several challenges during the year – severe drought, 2017 hedge loss, supply shortages and a notable change in portfolio due to the completion of the divestments and transfers of products related to ChemChina's acquisition of Syngenta.